When you have a deep-vein thrombosis (DVT), you need to treat it to avoid a life-threatening complication: a pulmonary embolism. A pulmonary embolism (PE) usually happens when a blood clot in the leg breaks away, travels to the lungs, and blocks a lung artery. It can damage the lung and other organs and lead to low oxygen levels in the blood. It can even be fatal. If you think you have a pulmonary embolism, call 911. A heart attack, pneumonia, and other things have similar symptoms to a pulmonary embolism. To find out if you have a PE, doctors may give you different types of X-rays and lung tests. If you have a life-threatening PE, doctors will give you a drug called a thrombolytic to dissolve the clot. These drugs can save your life, but they have a serious side effect: bleeding that is hard to stop. Doctors will carefully watch you for that. If you have a PE, your doctor will also give you a blood thinner. Blood thinners doesn't break up the clot. They prevent it from getting bigger and stop more clots from forming. You will probably take a blood thinner pill for 3 months or longer. If you take Coumadin, you'll need frequent blood tests to make sure you are getting the right dose. If you take a newer blood thinner, you won't need frequent blood tests. Newer blood thinners include Eliquis, Pradaxa, and Xarelto. 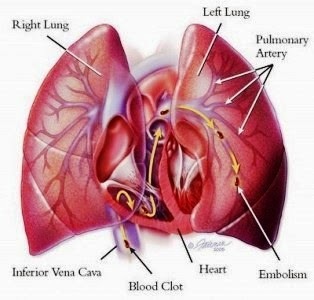 If you've had a pulmonary embolism, you and your doctor should figure out why it happened.